The pineapple (Ananas comusus) originated from Southern Brazil and Paraguay, where wild relatives can still be found, and is best grown in moist, warm air in tropical areas. This fruit is encased in a beautiful hardy exterior, with a yellow flesh inside. Pineapple can be described as having a very desirable sweet tangy flavor. It makes for a delicious food on its own and is also used in beverages, salads, meats, desserts and more. 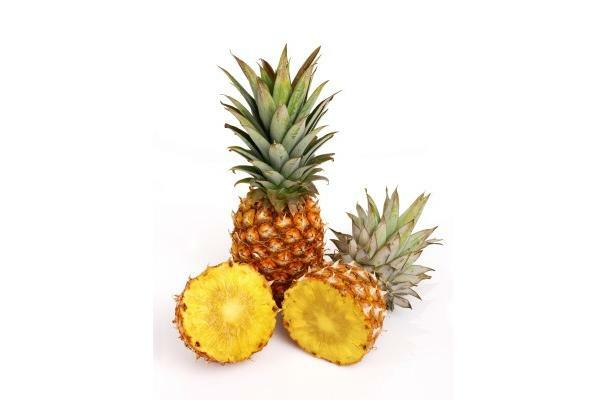 Pineapple contains proteolitic enzymes, like bormelaine and ananain, which can be employed as meat tenderizers. It has a very high content of vitamin C (1 portion of aprox. 150 g completely supplies the daily needs). Colors: Green and brown on the outside, yellow on the inside. Choosing: Check the base of the pineapple to determine how fresh it is. Keep in mind that the skin of the summer fruit wiill be greener due to faster internal ripening. If the fruit is green or just showing signs of colour and the base is dried and shrivelled with mould growing, avoid these! Look for those with eyes that are large and full. Avoid glassy eyes as these indicate the fruit is overripe, as well as pinched eyes as these indicate non-rope and very green pineapple. Also look for that nice sweet aroma. Buying: Any fruit market, or for canned ones, in the grocery. Procuring: Native to Paraguay and the southern part of Brazil. Pineapple is eaten fresh or canned and is available as a juice or in juice combinations. It is widely used in desserts, salads and complement to meat dishes and in fruit cocktail. Cleaning: Remove the skin in a cylindrical fashion. Pineapples can ripen after harvest, but require certain temperatures for this process to occur. Pineapples are chill-sensitive and should not be stored in the refrigerator. They will however ripen if left outside of a refrigerator. Ripening of this fruit can rather be difficult as they will not ripen for some time and in a day or two become overripe, which is why pineapples are most widely available canned. In some cultures, pineapples have become associated with the notion of welcome, an association bespoken by the use of pineapple motifs as carved decorations in woodworking. In the Philippines, pineapple leaves are used as the source of a textile fiber called piña. History: Natives of southern Brazil and Paraguay spread the pineapple throughout South America until it eventually reached the Caribbean. Columbus discovered it in the Indies and brought it back with him to Europe. Spanish introduced it into the Philippines, Hawaii, Zimbabwe and Guam.